“People living with dementia and other forms of cognitive impairment have a heightened risk of abuse as they may find it difficult to comprehend, recall or report their abuse,” Ms McCabe said. The National Plan to Respond to the Abuse of older Australians provides a framework for coordinated action across federal, state and territory governments over the next four years, with $18 million assigned for national trials of frontline services designed to support older people who are victims of abuse. There is no detailed research in Australia to determine the extent of elder abuse in Australia, but based on overseas studies the Government estimates that as many as 185,000 older people experience some form of abuse or neglect nationally each year. “We need national safeguards in place that protect the most vulnerable members of our community, and ensure the rights of people living with dementia and older Australians are protected,” Ms McCabe said. “Dementia Australia welcomes the framework and its commitment to promote the safety, dignity, equality, health and independence of older Australians through coordinated action. Dementia Australia provides a range of education and services to support people working with or caring for people living with dementia, to enhance the quality of life of the person living with dementia and reduce the potential for abuse. 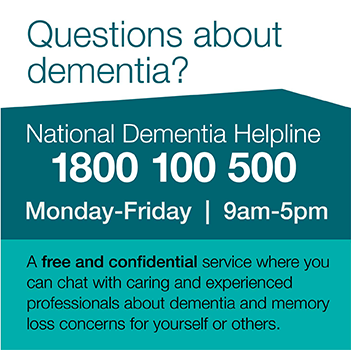 For more information please contact the National Dementia Helpline on 1800 100 500.